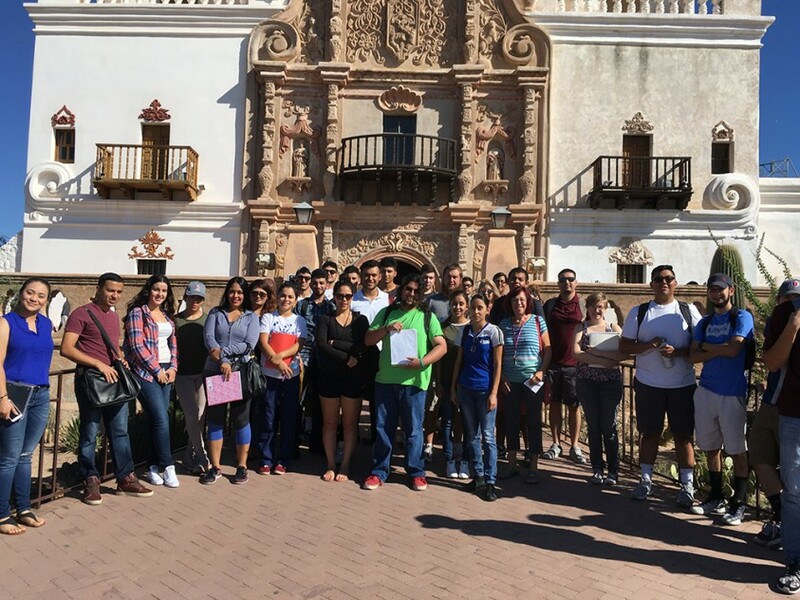 Students participating in Border Culture in the Classroom and the Public Square on a trip to the Mission San Xavier del Bac in Tucson, Arizona. Image courtesy of Pima County Community College. Located near the United States’s southern border, Pima Community College (PCC) is the primary public higher education provider for the Tucson area. It serves a large population of immigrant students, as well as people connected directly and indirectly with border control. As Sandra Shattuck, a faculty member at the college, describes the area, “Tucson offers a confluence of cultures since it sits seventy miles from the U.S.-Mexico border at Nogales and is also home to refugee and immigrant populations.” In response to an NEH call for proposals designed to foster public discussion about common issues, PCC created a program around an issue of intense interest to the community that would put its students in dialogue with regional culture: Border Culture in the Classroom and the Public Square. In a series of courses on writing, art, and history, students consider what it means to live alongside the U.S./Mexico border before moving on to the concept of borders more broadly as they think about the kinds of borders, physical and metaphorical, people navigate day in and day out. By taking several courses that adhere to the same theme, students are able to use their knowledge in multiple settings, a practice that encourages reflective processing and improved self-esteem among students for whom lived experience is a source of expertise in the classroom. At the same time, students are trained in how to have effective public dialogue about difficult, complicated, and/or controversial issues. They attend community events and report on their experiences. And they engage in conversations with students in Earlham College’s Border Studies Program, which is based in Tucson. In so doing they bridge another kind of border—that between the 2-year community college and the 4-year liberal arts school.